My children love to hear the classic story of the gingerbread boy all year round so I thought it might be fun to look for some related activities. 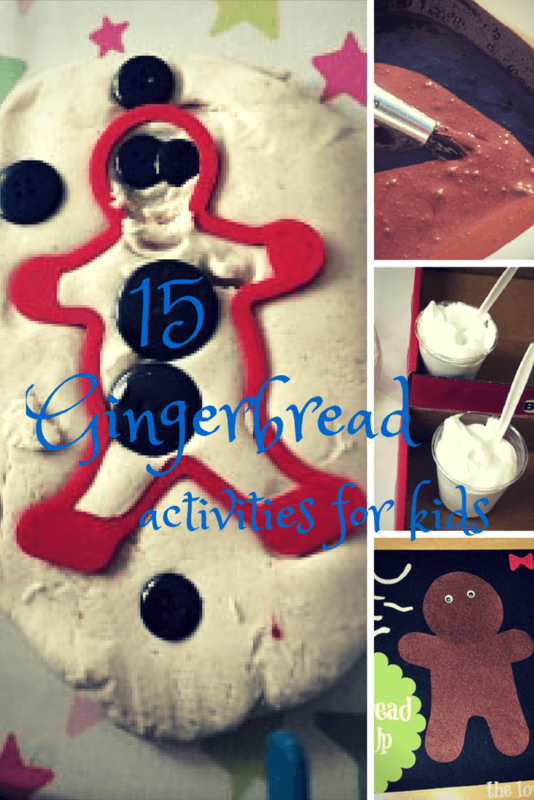 Here our 15 brilliant gingerbread activities for kids. I love this idea of crafting a gingerbread house themed puffy paint shadow box from Teach Preschool. I’ve never made our own puffy paint but it sounds simple, and I think I might try adding some ground gingerbread for a full on sensory experience. My children love to use their hands so gingerbread playdough is a favourite activity. For more hands on ideas how about gingerbread cloud dough, crafting with scented gingerbread paint or making a puffy paint gingerbread house and man. I found a great idea for a gingerbread sensory play from little bins for little hands. My 4 year old loves freezing his toys and watching them melt so I can’t wait to use our gingerbread man baking tray for some icy gingerbread fun. For added value we will be experimenting with salt, baking soda, food colouring and vinegar, I know he’ll be so excited. I thought we could try a similar activity with baked gingerbread men (any excuse for a baking session). The Pre-School Tool Box blog have a fun post about dissolving gingerbread men and I would love to try this at home. After all that baking and eating I would definitely want my children to run around on a gingerbread man hunt. There are some lovely crafts relating to gingerbread men and most of these could be set up in advance, I love having a little invitation to play ready for my 4 year old when he gets back from school. There are fun paper bag gingerbread men from No Time for Flashcards, a felt gingerbread person dress up from The Iowa Farmers Wife, and an adorable gingerbread man in a matchbox. If you’re looking for some simple decorations then gingerbread house ornaments made with styrofoam from happy hooligans are sure to be popular. This gingerbread house garland from Craft and Creativity is really fun (we made our own version for Advent) as is this gingerbread salt dough garland from Sugar Aunts. I love making gingerbread Christmas tree decorations, although they never make it to the tree! Sounds like some fun ideas, especially the puffy paint! Saw your link on #Pintorials. This is a great round-up of ideas ~ thanks. Thank you so much for linking up to The Sunday Showcase last week. What a wonderful round up of ideas!